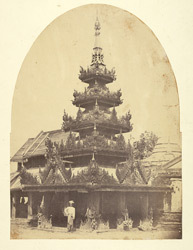 View of a Buddhist shrine or devotional hall in the form of a tazaung or pavilion at Prome (Pyay) in Burma (Myanmar). The tazaung has a multi-tiered roof that becomes smaller as it rises and ends in a spire, an architectural element designating sacred space. Burmese wood carvers are historically renowned for their technical skill and creativity, and the pillars and eaves of the tazaung are encrusted with intricate and flamboyant wood carvings. Among the decorative elements are carved pediments decorated with flaring ornamental elements in the form of haunches of a wild ox known as saing-baung, flame-like finials, mythical birds and spirit figures from Burmese cosmology. Prome, established during the Pagan era, is an important transshipment centre for cargo moving along the Irrawaddy river between Upper and Lower Burma.